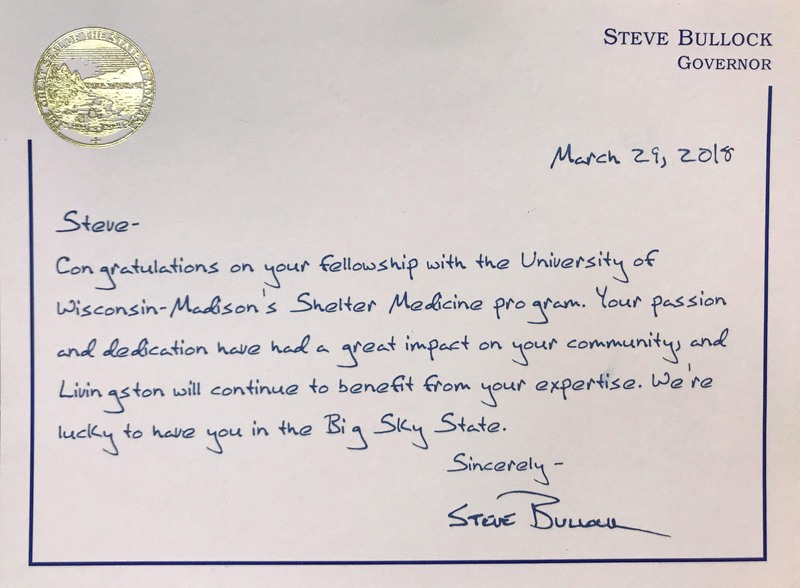 We are so proud to announce that Stafford Animal Shelter was accepted into the University of Wisconsin-Madison Shelter Medicine Program’s Northern Tier Shelter Fellowship. The Shelter Fellowship program was created in conjunction with the University of California-Davis Koret Shelter Medicine Program to build a learning community that provides training and support for animal shelter administrators to deliver life-saving knowledge and services to the nation’s homeless pets and communities. The prestigious fellowship provides a unique opportunity for administrators to work directly with academic and clinical instructors from both institutions as well as national animal welfare organizations, to benefit from their expertise on diseases, shelter procedures, community programming and more. Chloe, an adoptable cat from Stafford Animal Shelter, peers from the top of her perch. Photo: Rachel Leathe Bozeman Daily Chronicle. Aleisha Swartz, DVM serves as an outreach Veterinarian for the University of Wisconsin School of Veterinary Medicine, Dr. Swartz has visited Livingston and consulted for Stafford Animal Shelter. She says of the fellowship acceptance “Congratulations to Stafford for all they have accomplished. We are happy to have them and our team is looking forward to working together this year”. The fellowship begins on June 4th, 2018 with a travel expense paid trip to the University of Wisconsin in Madison. Stafford Animal Shelter is an open-door shelter that accepts every pet in need regardless of species, breed or medical condition. 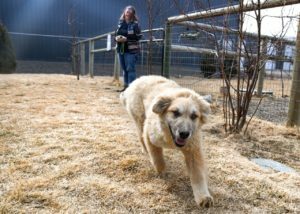 They have no restrictions on length of stay and pets are provided a safe haven for as long as it takes to find them a new home. 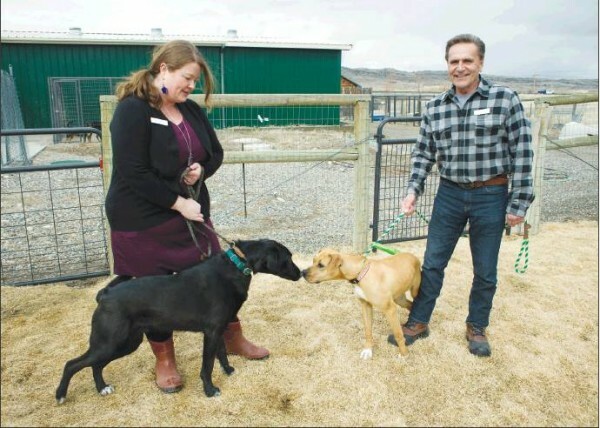 Stafford has served South Western Montana since 1999 providing care to lost and unwanted animals as well as providing valuable community resources such as veterinary assistance funds, temporary crisis sheltering, behavior training and pet food for low-income families. Alicia Davis plays fetch with Zelda, a rescue through Stafford’s “Pure Bred Rez Dog” program. Photo: Rachel Leathe Bozeman Daily Chronicle. We were happy to receive press on our fellowship from The Livingston Enterprise, Bozeman Daily Chronicle and Big Timber Pioneer. 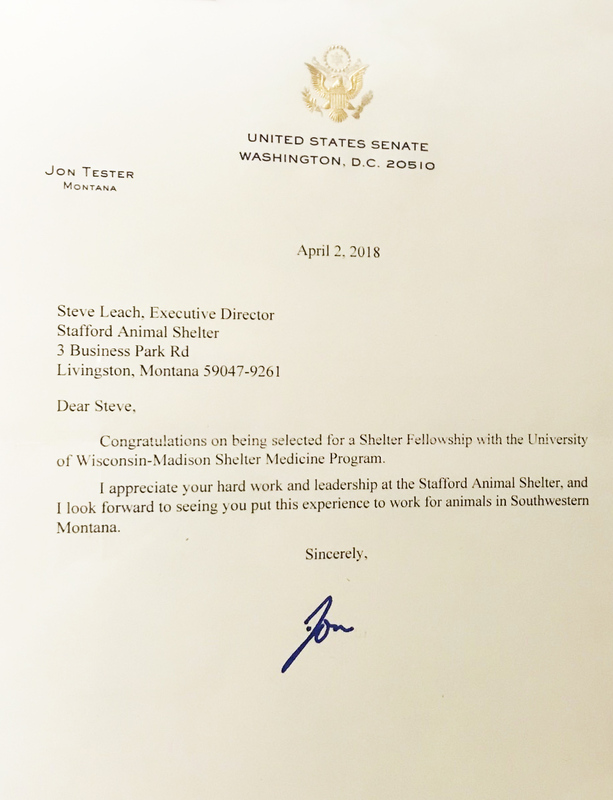 Thank you all for your congratulatory messages, including Governor Bullock’s and Senator Jon Tester’s offices (below) and donations for our Shelter. We are excited to start our fellowship and will post updates along the way for you to learn along with us. ← Stafford Shelter Obedience Classes at The Shane Center!